Use VLOOKUP to compare trial balances. Sometimes you have two (or more) trial balances for different accounting periods which you need to compare. 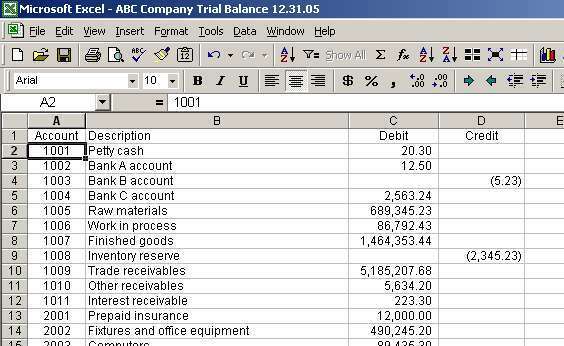 If the list of trial balance accounts changed from one period to another, it may become difficult to match the accounts side by side. This Excel lecture explains how to use VLOOKUP to build a comparable trial balance for two or more periods. Screen prints and sample Excel files are provided so that you can practice while reading the lecture. Major Excel functions employed in this task are SUM, IF, ISERROR and VLOOKUP. After some practice, the procedure explained below takes about 5-7 minutes. The company name and numbers in this lecture are not real and no association with a real company with a similar name, if such exists, should be made. "8" - other expenses account. 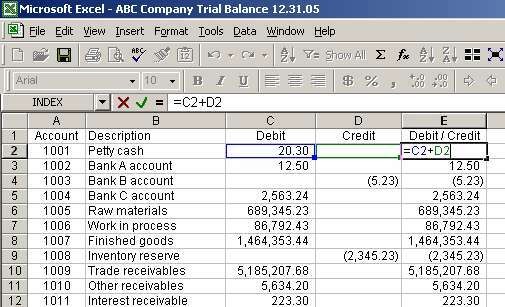 Before working with any trial balance, we should ensure that debits equal credits. Let's check that our trial balance files.